You’ve probably seen the signature burger on the menu at your local upscale bar/restaurant. It features way too many ingredients or some outlandish combination of them that draws in the truly adventurous. Eater’s trendy restaurant menu parody called it the “Burger That’s Crazier Than It Needs To Be”. Company websites, too, have gotten crazier than they need to be. A chef can do for comfort food what a web designer can do for a company website. She can elevate it to expressive art, or make it trendy. But in so doing, she can make you forget why comfort food and company websites exist in the first place! 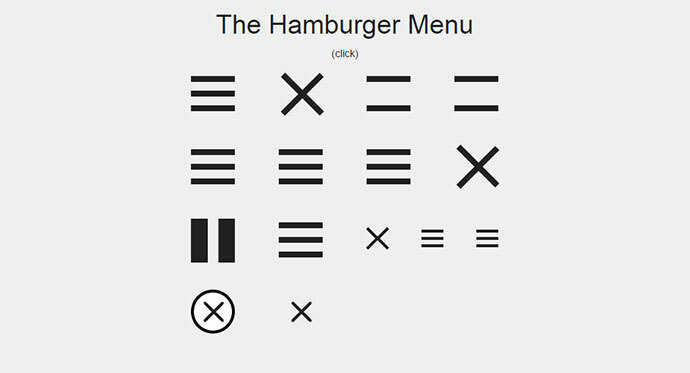 These days, the simple three-line “hamburger” icon is a staple of responsive web design. It floats at the top of your smartphone screen while you scroll down the page. When you click on it, out flies a full navigation menu. This ironically named feature has become the gateway to animating everything else. Parallax view – the BBQ sauce of contemporary web design; it’s sticky, messy, and totally unnecessary! Page elements (images, icons, text blocks) that have to float, fly, flip, fade, spin, bounce, or whatever, on page load. Because information is boring, right? We avoided using these distracting features, which we had seen repeated on many agency-designed websites. We wanted our site’s design to give style and substance equal weight. Our web designer listened to us, and gave us an elegant container that fit and complemented our content. Coming Soon: See an alternate version of my homepage that includes all those features! Why do web designers do this? And why do clients let them? AEC professionals (who are designers themselves) often go along with these choices. Sometimes they want to. Sometimes they are dazzled by it. Sometimes they feel they must do so to impress peers or compete with rivals, or because it’s part of their identity. Sadly, designers are convinced that static web pages aren’t enough; information is boring. So-called “brochure” websites don’t stand out anymore, and with so many options to play with in the leading CMS platforms, why not experiment?! They want their work to look cool and hip, and reflect them well. Professional web designers don’t want to do boring work. Nor do they want to do the kind of work that a kid or a do-it-yourselfer would do. Our website isn’t featured prominently in our designer’s portfolio, and that’s just fine by us. It’s tempting to blame Signature Burger Syndrome on web designers and their clients. But the tools and the technology they contain also contribute to this sophisticated sameness. It’s good that web designers and clients finally have something just as stimulating to move onto from Flash animation. But it’s too tempting to put all of that, um, flash into a website that doesn’t need it. The current standard, HTML5, is a low-cost alternative to video content, which is still beyond the means of most clients. What can you do to prevent Signature Burger Syndrome from showing up on your website? Get great images that can stand for your brand. Create informative visuals (such as data visualizations and infographics) that educate, entertain, and engage. These do the work of moving pictures while still being static. They also keep visitors on your site longer. Write compelling text with a clear and credible voice, and make sure it is spell-checked and proof-read. If you’re going for a more conversational tone, read it out loud, too, to make sure it will “scan”. Look for good stories to tell, and strive to be concise. Design-product Systems has the antidote to Signature Burger Syndrome. Our Design Storytelling and Marketing Systems services are as classic a combination as bacon and bleu cheese! Try us today!